So, here's the thing: I LOVE peanut butter. And what I love the most is peanut butter and chocolate. It's such an exquisite combination and this is why there is a long list of treats featuring those two ingredients!! It had been a long time since I’ve had peanut butter cups, as here in France it's impossible to find those yummy cups (Reese's cups), so the only solution I had to squelch my chocolate and peanut butter cravings was to whip up a homemade batch, and I am so glad I did, it was one of the easiest and quickest recipe! 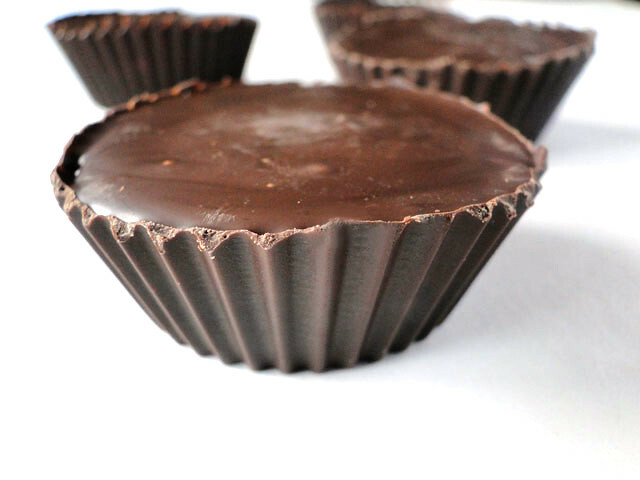 So, if you are a Reese's Peanut Butter Cup fan like I am, then you will want to make these delicious sounding delicacies! 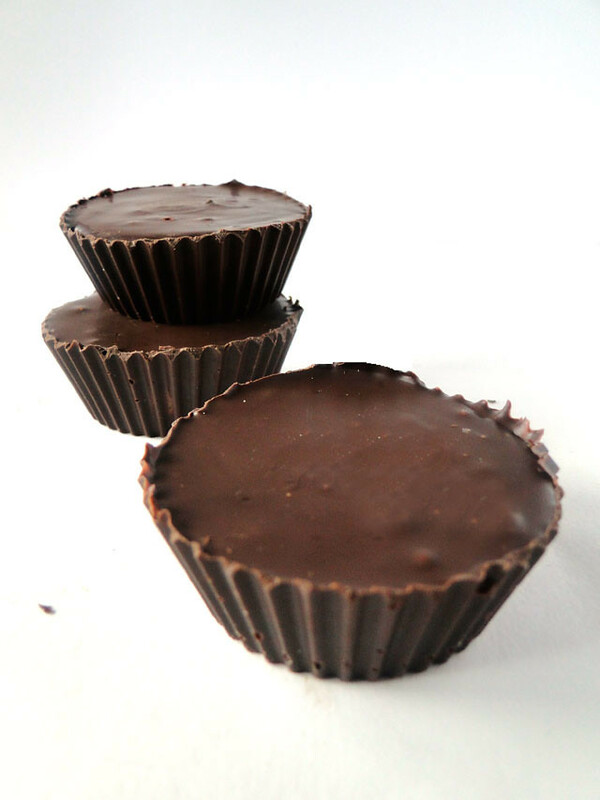 All that is required is to melt some chocolate, spread a little in a candy cup, chill the cups then top with a little peanut butter mixture, and then drop a little more chocolate on top. That's all! 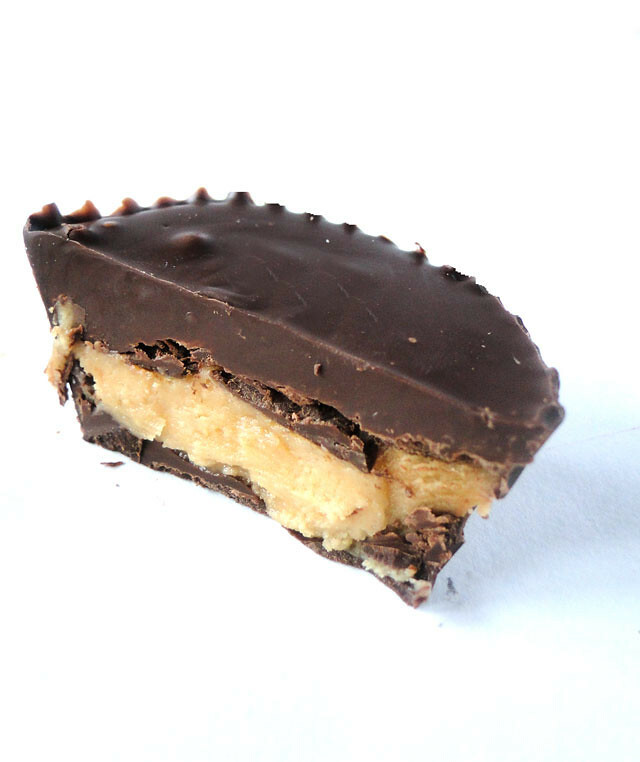 And the result is a delicious shell of chocolate filled with a creamy peanut butter mixture. Melt the chocolate using a double boiler checking and stirring every 15 seconds until smooth and creamy. In a bowl, mix the peanut butter and the powdered sugar. Add the vanilla then the milk, one tablespoon at a time until you get the desired consistency. You want the mixture to be firm, but spreadable. Set aside. Once the chocolate is melted, stir and dollop about 1 tablespoon of the chocolate into the bottom of a muffin cup. Using the back of your spoon, smooth the chocolate around so that it completely coats the inside of the muffin liner. Repeat this step for 24 cups. 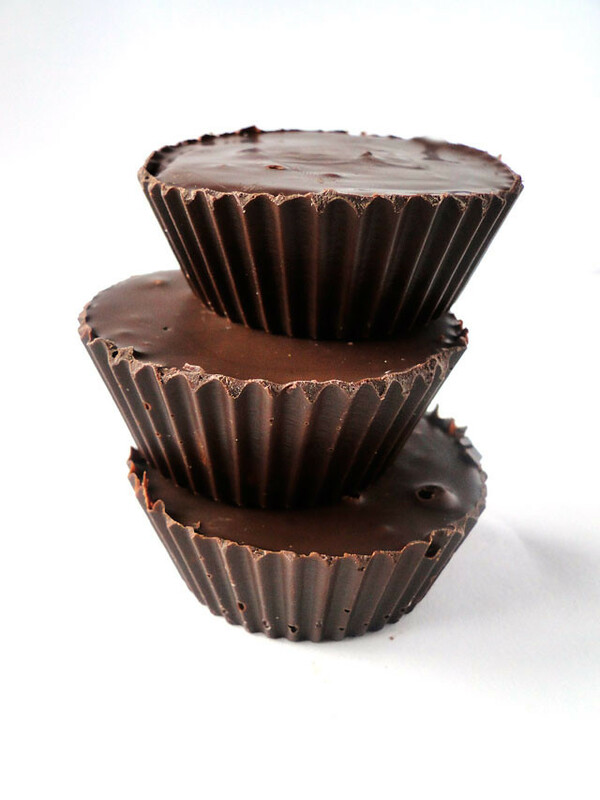 Place the cups on a tray and put them in the fridge for about 20 minutes until the chocolate is totally solid. Take about 1 tablespoon of the peanut butter mixture and drop it on top of the firm chocolate. With a finger, smooth the filling down so that it’s flat. Top with melted chocolate until all the peanut butter is covered. Spread the chocolate around with the back of your spoon. Again, put these cups on a tray and return to the fridge to harden. Dans un bol, mélangez le beurre de cacahuète avec le sucre glace. Ajoutez l'extrait de vanille et le lait, 1 cuillère à la fois jusqu'à obtenir la consistence désirée. Le mélange doit être ferme mais facile à étaler. Réservez. Une fois le chocolat fondu, versez 1 càs dans des moules à muffins. Avec le dos de la cuillère, étalez le chocolat sur tous les côtés. Continuez avec les 24 moules. Placez les moules sur une plaque et mettez-les au frigo environ 20 mn. Déposez 1 càs de beurre de cacahuète dans les moules, puis ajoutez 1 càs de chocolat fondu. Étalez bien le chocolat avec le dos de la cuillère. Réfrigérez de nouveau jusqu'à ce que le chocolat soit ferme. j'adore le peanut butter moi aussi et je craque pour tes réalisations! bravo chicho! I Love those! So addictive. C'est très joliment fait; mes enfants vont adorer, moi le peanut butter j'adore, avec le chocolat, moins. Je prefere garder les deux sépares! Oh heck yeah!!!! They look perfect! I love peanut butter cups!!!!!! I have never had home made ones, they look so very very good! Thanks so much for sharing this marvelous creation! 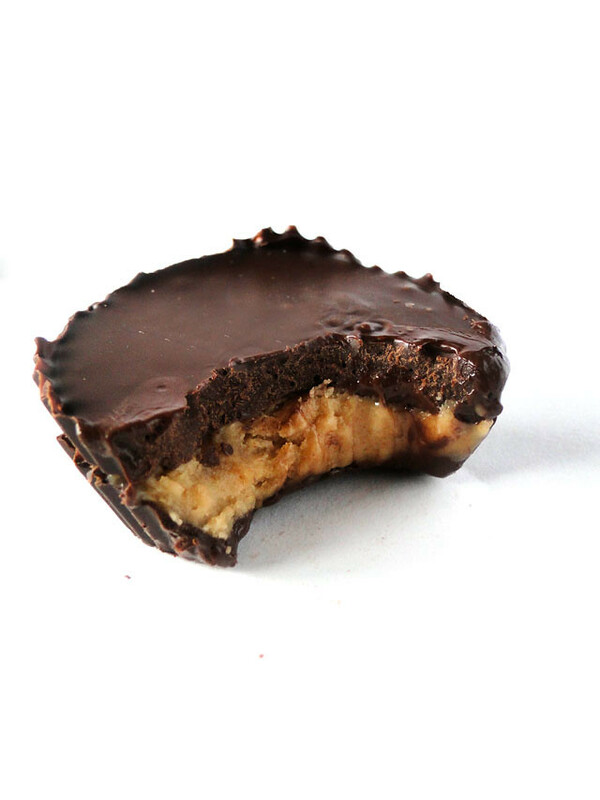 Peanut butter cups are one of my guilty pleasures. But I'm thinking I am truly missing out by not eating these homemade treats. These would be great as a homemade Xmas present if you can bear to gove them away too ^_^ I'm on the lookout for such recipes at the moment. OMG Chico... could eat a whole box of these! Thanks for sharing, gotta try this. Comme c'est mignon ! et je me disais en descendant, j'aimerais bien voir l'intérieur, et hop quelques roulements de souris plus bas que vois je ??? une délicieuse gourmandise ! Oh it can't be right to be able to make these at home, I could have a serious chocolate and peanut butter issue. Yum, like chef Dennis I've never had homemade peanut butter cups either. They must be delicious! Oh dear! Cherine, I had to cover my eyes when I got to the recipes, because I KNOW that if I knew how to make these I'd EAT THEM ALL!!! They look AWESOME! WOW, you are quite an accomplish baker/candy making Cherine. I am so impressed! I have to try making these! Peanut butter and chocolate are so great together, and homemade treats are always best. These look heavenly and super addictive! Wow, these cups look scrumptious... I only tasted peanut butter with apricot jam and it was yummi, but never with chocolate, it should so delicious. Très très gourmandes ces bouchées au chocolat!! I bet the homemade version of Reese's are even better! These look delicious. I never would have thought to make these at home. They look great! They look fabulous - I love peanut butter cups too. Reese's (the company that makes them here in Canada) has come out with a DARK chocolate version. Yum.